Coming up the next two weekends, January 14th & 15, and January 21st & 22nd, El Dorado Guitar Accessories will be exhibiting our unique handcrafted guitar straps and accessories at The Texas Amigos’ California Winter Shows. On January 14th & 15th we will be up in the Bay Area World Guitar Show at The Marin Civic Center, San Rafael. The following weekend, Jan 21st & 22nd, we will be at the SoCal Show at the Costa Mesa Fairgrounds. 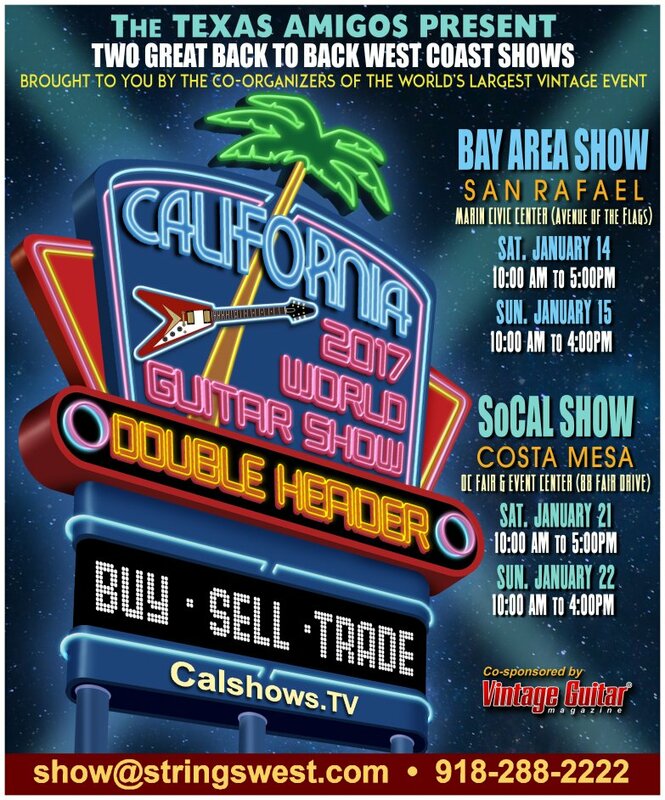 The SoCal show runs concurrently with NAMM weekend, so many NAMM attendees typically head down the Freeway a dozen miles to see all the cool vintage guitars and equipment, and to check out our El Dorado guitar straps and products. NorCal or SoCal, we hope to see you this January. This entry was posted in Sticky, Upcoming Guitar Shows on January 11, 2017 by Bill Silverman.